1. Everything is so animated, happy, upbeat, clean, modern, orderly and safe. There is so much culture on every street. Singapore feels like a festival 24/7 because everything and everyone seems to be celebrated and each area has a different theme. They celebrate and acknowledge many cultures making the country diverse yet unified. According to Singapore’s Department of Statistics, 74% of the population is Chinese, 13% are Malay, 9% are Indian, and 3% are labeled as other. Another melting pot besides NYC errr Disneyland. 3. The transportation system is on point. There are always a plethora of taxis or Ubers available and they are all meticulously maintained due to local regulations. The drivers are all extremely polite as well and will give you the best tips on where to eat, what to do and even teach you about the culture. Singaporean taxi drivers are typically called “Uncles” which I thought was cute – makes it feel like the whole world is a big family:) I was lucky to get really good drivers each time and they gave the best recommendations and basically created a whole itinerary for me. 5. It feels like Summer year round due to the humidity (don’t overpack) so you can spend every night outside at local restaurants, shopping malls or bars/lounges. I hung out at an outdoor shopping mall/food court with bars, clubs and rides on a Tuesday night after landing – there is always something to do for people of any age. I LOVED Clarke Quay – you have to go and experience this place but here is a great curated list here. 6. Singapore is the fourth most expensive country for expats to live in in the world. It is also one of the richest countries in the world in terms of GDP. I don’t mind expensive countries because that typically means they are safe – so thank you Singapore for being expensive. #keytosuccess Here is an article that lists some of the most expensive things to do in Singapore. 7. The food is incredible and everything is available 24/7. You have to try the dim sum and street food too! Love not having to worry about food poisoning in an Asian country – major win. 8. Singapore is home to the world’s highest and largest rooftop pool (495 feet) at Marina Bay Sands and many other man-made attractions. 9. Singapore has the most beautiful museums and gardens. 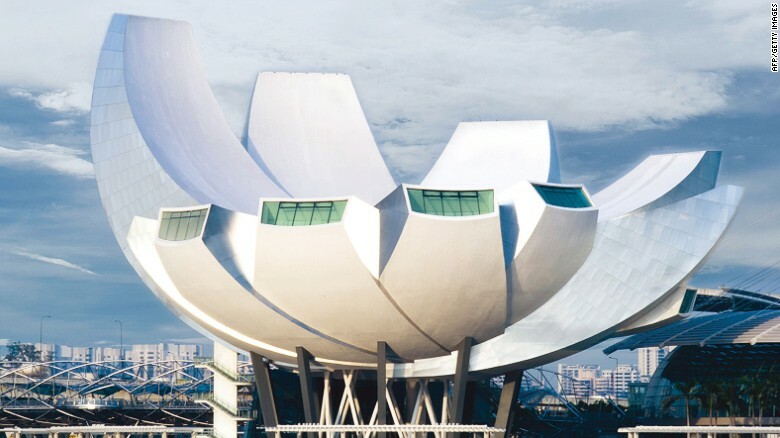 The ArtScience Museum looks either like a robotic hand or lotus flower but either way it is magnificent. Singapore is also home to two of the world’s three most expensive buildings (including the high-rise “stranded surfboard,” formally known as Marina Bay Sands), a concert hall shaped like a durian fruit and a museum that looks like a split banana. 10. There is something for everyone. Universal Studios Singapore, the MegaZip zip line at Sentosa, the KF1 Karting circuit at Kranji, casinos at Marina Bay Sands and Resorts World Sentosa and water parks throughout the city, Singapore is definitely a giant playground for everyone. They also have 18 man-made “trees” each loaded up with intricate vertical gardens. The colossal solar-powered supertrees are part of the 250 acre Gardens by the Bay and there is a light show each night. 11. It is easy to travel to other destinations in Asia from Singapore. Being that the country is only 31 miles from easy to west and 16 miles north to south – you can see all of Singapore relatively fast. Some places I recommend visiting after are Bali, Thailand, Australia and New Zealand. 12. The colonial architecture in Singapore is like no where else. The island has beautifully preserved colonial architecture from the 19th century including grand white monoliths, intricate columns, balustrades and verandahs. 13. The Singapore Changi Airport is consistently voted the world’s best airport in both industry and consumer polls due to the outdoor nature trail, gardens, swimming pool, movie theater, hawker-style food stalls, shopping and reflexology centers. 14. The flight attendants uniforms were my FAVORITE. I loved the rich color palette, the tailored fit, the material – everything was perfect. Of course they were designed by Pierre Balmain in 1968 – truly timeless and exotic ensembles. 15. The hotels are great in Singapore. I suggest staying at the Raffles Hotel, Marina Bay Sands, Carlton Hotel Singapore or the Peninsula Excelsior Hotel. 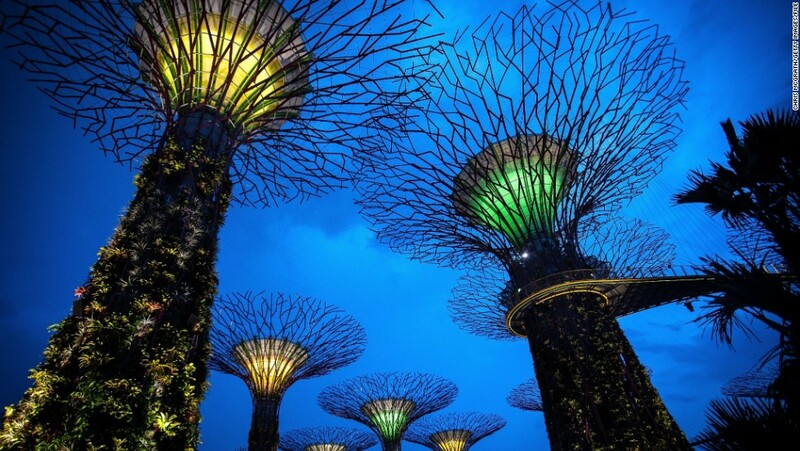 Singapore is commonly coined as “the best place to do business” and “most livable city in Asia.” I have to agree – this intriguing blend of Western modernity and Asian culture has me wanting to go back and experience more of this beautiful country. If you would like to move to Singapore for yourself, check out this website and apply for a visa today. Thank you for a beautiful and unforgettable time! Here are more stories from my experience below. These adorable and sweet girls asked me some survey questions about Chinatown in Singapore for a project they were doing for school. So cute! From colonial shopping malls to the mayhem markets. Sky on 57 – a rooftop bar you MUST experience. A local Singaporean snuck us up here to see the view and it was truly incredible. I stayed out almost all night that Tuesday night – what an adventure.